Die autosomal-rezessive Erkrankung Familiäres Mittelmeerfieber (FMF) betrifft vorwiegend Patienten aus dem südlichen und östlichen Mittelmeerraum. Das Manifestationsalter liegt in 90% der Fälle vor dem 20. Lebensjahr. Nach Identifizierung und Klonierung des verantwortlichen Mediterranean-Fever (MEFV)-Gens kann die Diagnose FMF in den meisten Fällen auch molekulargenetisch gesichert werden. 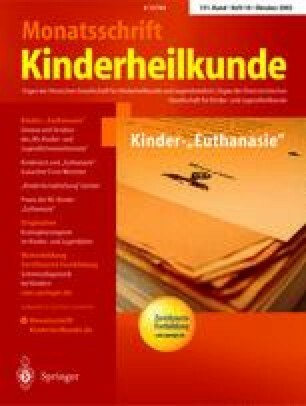 Bei 40 Kindern aus Berlin (Alter 2–17 Jahre), von denen 27 aus der Türkei und 13 aus dem Libanon stammen, wurde wegen FMF-verdächtiger Symptomatik oder positiver Familienanamnese nach Mutationen im MEFV-Gen gesucht. Das Alter bei Beginn der FMF-Symptomatik lag bei 2,5 Jahren, die Anamnesedauer bis zur Diagnosestellung bei 0,5–12 Jahren. Homozygot (vornehmlich Mutation M694 V) waren 14 Patienten, compound-heterozygot 12 Patienten und heterozygot 8 Patienten. Die Trias Fieber, Bauchschmerzen und Arthralgie war bei 50% aller Patienten zu beobachten, in der Gruppe der für die Mutation M694 V homozygoten Patienten mit 93% deutlich häufiger. Diese Patienten sprachen gut auf die Kolchizintherapie an. Familial Mediterranean Fever (FMF) is an autosomal recessive disease characterized by recurrent attacks of fever often combined with polyserositis. Persons of eastern and southern Mediterranean origin are affected most frequently. In 90% of affected patients, manifestation is seen before 20 years of age. Following identification and cloning of the responsible Mediterranean Fever (MEFV) gene, FMF can in most instances be verified by mutational analysis. We report on 40 children of Turkish (n=27) and Lebanese (n=13) origin between 2 and 17 years of age. Mutational analysis of the MEFV gene was performed because of symptoms suggestive for FMF or a positive family history. The mean age at commencement of FMF symptoms was 2.5 years, and the time to definite diagnosis ranged from 0.5 to 12 years. Following identification of 24 index patients, FMF could be confirmed for 16 additional family members. Half of all patients were homozygous, predominantly for the mutation M694 V (n=14). Twelve patients were found to be compound heterozygous and eight showed heterozygosity only. Fever was present in 88% of all patients, 50% were symptomatic with the triad of fever, abdominal pain, and arthralgia. Erysipelas-like skin lesions occurred in 20%. In patients with homozygosity for the mutation M694 V the triad of fever, abdominal pain, and arthralgia was seen in 93% of our patients. In this group colchicine therapy proved to be very effective. The discovery of the MEFV gene and the ongoing identification of mutations has facilitated early detection of FMF. Especially patients with homozygosity for the mutation M694 V are prone to a severe clinical course, but they respond favorably to colchicine therapy. The variability of the clinical presentation is related to both allelic heterogeneity and additional disease-contributing factors other than the MEFV gene.